TAKE ACTION–Now that House Bill 40 protecting women’s reproductive rights is on Gov. Bruce Rauner’s desk, Equality Illinois urges him to sign it. And we ask YOU to send your own message of support for HB40 to the governor at http://tinyurl.com/SIGNHB40. All Illinoisans should be able to make the most fundamental decisions about their body and their most intimate relationships free from government overreach. And with the rights of women under attack by the Trump Administration, it is more critical than ever that Illinois protect reproductive freedom for women. 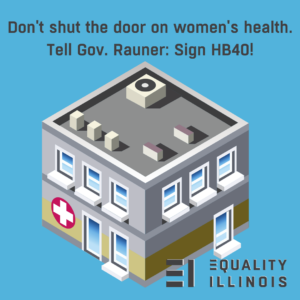 HB 40 will preserve reproductive choice for Illinois women and ensure reproductive health care is available to the many women who access it through Medicaid and state employee health insurance plans. This struggle is about fairness and protecting the private medical decisions of women.